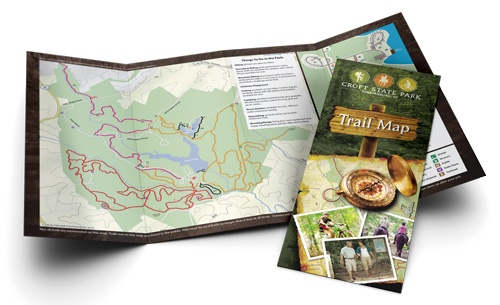 The park covers more than 7,000 acres and features over 50 miles of trails. Whether you are exploring on foot, by bicycle or on horseback, use this site to discover points of interest along your journey. This land was once home to a farming community and old farmsteads can still be found throughout the Park. Whitestone Springs attracted visitors in the late 1800's and early 1900's. You can have a drink from the Spring today and see the foundation of a 4 story hotel and evidence of the bottling business (Rocky Ridge/Whitestone Spring Trail). World War II brought about the need for more training facilities. James F. Byrnes, a SC Senator and Spartanburg native, was instrumental in bringing the training camp to the area. In 1940 construction began converting 19,000 acres of tobacco and cotton fields into a military camp that contained a series of firing ranges, a gas obstacle training course, and a grenade court. The name of the camp honored South Carolina native Major General Edward Croft, the US Army Chief of Infantry who died in 1938. The first troops began training on March 7, 1941 and the camp eventually housed 250,000 soldiers. The facility was shut down after the war and opened as a State Park in 1949. Today it is one of the largest tracts of land in the SC State Park Service. Begin exploring this state park and its rich history. We suggest using this mobile site with your GPS enabled device, but you can download a print version of the map here.